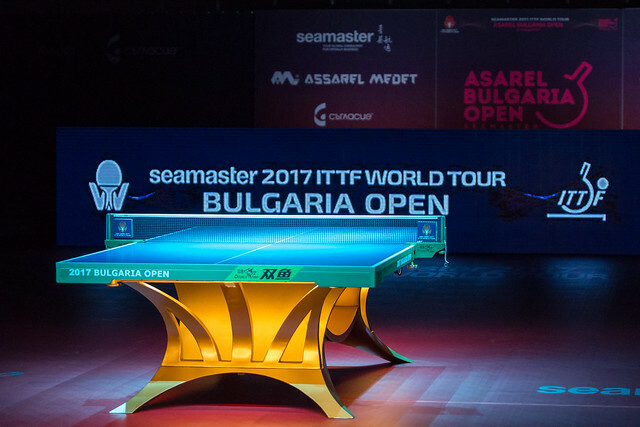 The Seamaster 2017 ITTF World Tour Asarel Bulgaria Open is officially underway and the first piece of action on the day's schedule came from the Women's Doubles competition, which featured play from the Round of 16 on the morning of Thursday 17th August in Panagyurishte. One fixture which really stood out in the morning session saw Hungarian competitor Szandra Pergel and Kinga Stefanska of Poland pull off a dramatic victory. Barbora Balazova and Hana Matelova, who represent the Slovak Republic and the Czech Republic respectively, were seeded sixth for the Women’s Doubles event but rather astonishingly the win went to the unseeded pairing of Szandra Pergel and Kinga Stefanska in what turned out to be a highly entertaining fixture (9-11, 11-8, 9-11, 11-3, 7-11). Hana Matelova’s exit came as an early blow to the Czech Republic but there was reason for the country to celebrate after Dana Cechova and Iveta Vacenovska successfully came through their tie against the 10th seeds Mihaela Dimova and Maria Yovkova of Bulgaria. Despite entering the match with home advantage on their side Mihaela Dimova and Maria Yovkova proved unable to avoid an opening round elimination from the event as the Czech partnership of Dana Cechova and Iveta Vacenovska prevailed in straight games (11-3, 11-9, 12-10) to book a meeting with the top seeded team of Japan’s Honoka Hashimoto and Hitomi Sato in the next round. Another Japanese combination through to the Women’s Doubles quarter-finals is the pairing of Kasumi Ishikawa and Mima Ito, who are the fourth seeds for the tournament. While the opening game against Chinese Taipei’s Lee Yu-Peng and Tsai Yu-Chin produced a closely fought contest, the remainder of the encounter proved fairly one-sided as Kasumi Ishikawa and Mima Ito stormed to victory without dropping a game (9-11, 1-11, 4-11). Next up for Kasumi Ishikawa and Mima Ito is a fixture against another Chinese Taipei partnership, after Huang Yu-Chiao and Wang Yi-Ju came out on top in their Round of 16 encounter. Facing the mixed nationality pairing of Turkey’s Sibel Altinkaya and Audrey Zarif of France, the fifth seeds Huang Yu-Chiao and Wang Yi-Ju were pushed hard throughout the tie with all four ends going to deuce (10-12, 10-12, 12-10, 10-12) as the Chinese Taipei duo squeezed through to the last eight.